Farming is a big part of life in Northern Ireland, says DW Online. Around 48,000 people are employed in the sector and total gross output for agriculture last year reached more than €2 billion. But the industry is at risk. A loss of EU subsidies and the threat of a hard border with the Republic of Ireland has Northern Irish farmers concerned. This is nothing new to us, and only what the legacy media is dribbling out, day on day, week on week. 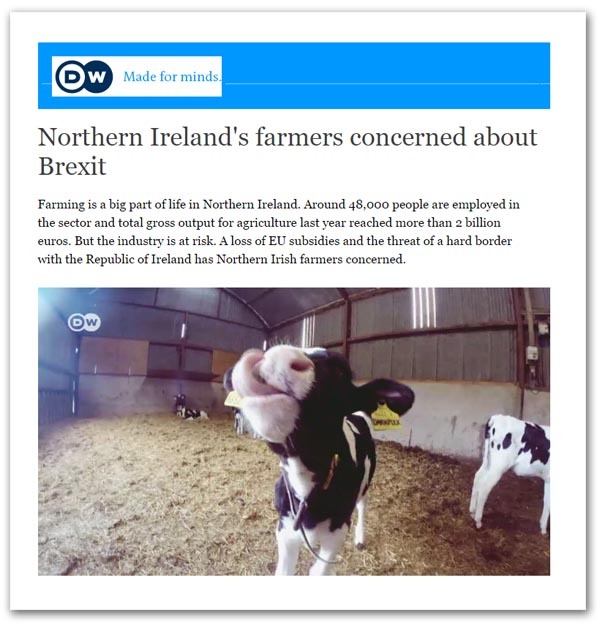 But, watching the video embedded with this piece, and following the media generally, one gets the impression that the entire Irish farming industry is on another planet when it comes to Brexit. Not least of their problems is the huge volume of raw milk crossing the border from the UK to Ireland every day to be processed there. This amounts to about 800 million litres in 2016, corresponding to some 12 percent of Ireland's milk production pool. What the commentators do not appear to understand is that, irrespective of whether we get a hard or soft Brexit – and even if tariff problems are sorted (which, more likely they will be) - Regulation (EU) 2016/429 and Regulation (EU) 2017/625 will apply (when they come into force - similar, existing legislation currently applies). The first is on transmissible animal diseases and the other sets out on official controls and other official activities performed to ensure the application of food and feed law, rules on animal health and welfare, plant health and plant protection product. The latter is so new that it was only published in the Official Journal on 15 March. Up until then did not have a regulation number, but we've met it before. This is the Regulation which consolidates multiple regulations dealing with the import of foodstuffs, and which converts Border Inspection Posts and Community Entry Points into the standardised Border Control Posts (BCPs). Article 47 is the one to watch. It requires the competent authorities of all Member States to "perform official controls, at the border control post of first arrival into the Union, on each consignment … of animals; products of animal origin, germinal products and animal by-products; [and] plants, plant products …". Upon Brexit, therefore, consignments of milk, meat, vegetables, and products made from them (as well as live animals), on their way from Northern Ireland to the Republic must be presented to a BCP. And, as it presently stands, there are facilities only in Dublin and Shannon. There is one possible way out, allowed for by Article 73 of the 2017 Regulation. This gives power to the Commission to permit third countries to carry out their own pre-export controls in order to reduce the amount of checking at the borders. However, this does not affect the right of Member States to carry out official controls on imported feed and food to verify that the pre-export checks carried out in the non-EU country remain effective. Furthermore, in the past, the Commission has been very sparing in the use of this power (as enacted in previous legislation). Only two approvals have been given, one to the United States relating to "peanuts and derived products thereof as regards the presence of aflatoxins" and the other to Canada relating to "wheat and wheat flour as regards the presence of ochratoxin A". The chances, therefore, of the Commission delegating powers to a post-Brexit UK seem pretty remote, although this could be brought up during the Article 50 negotiations and embedded in the settlement, or the transitional agreements. This won't happen though unless the need is realised. Yet farmers and the food industry are being silent about something which could bring cross-border trade to a complete halt. Nor is the silence confined to the food and farming industries. In an extraordinary piece in the Observer last Sunday, on: "How to move an elephant to Europe post-Brexit". "Leaving the EU could make moving animals abroad for breeding programmes a lot harder", writes Emine Saner, adding: "But how easy is it to transport zoo inhabitants across the continent anyway?" At the moment, we are told, breeding progammes in Europe are overseen by the European Association of Zoos and Aquaria (EAZA), and work efficiently thanks to shared resources and free movement. "I think the lack of clarity [over post-Brexit legislation] is the largest concern for us", says Zak Showell, animal records registrar at Twycross zoo. "There are more than 400 breeding programmes operated by EAZA. These breeding programmes are there to ensure the genetic and population survival of those species we have in captivity". But about veterinary inspections, border control posts and entry documents, nothing at all is said. Brexit won't necessarily stop this [animal movement] altogether, but as with the movement of people, it will probably make it harder, Emine Saner tells us. And that is all we are allowed to know. There are times when one could almost think that the legislation we are warning about is a figment of the imagination – that border control posts and all the rest don't really exist. They are certainly invisible to the media, most politicians and the food and farming industries. Official secrets are not guarded as effectively as details on BCPs. That this is the case is quite extraordinary. The implications of the system applying to the UK as a whole – not just Northern Ireland – are profound, yet no one wants to talk about it.